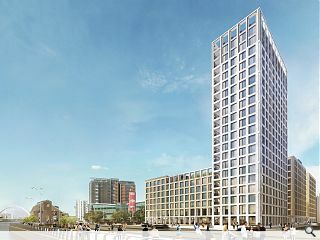 A slow burning build to rent revolution in Glasgow has taken another step forward with the submission of a 500-home waterfront PRS scheme at Central Quay. The £90m development is being spearheaded by developer, property manager and investor Platform_ which has selected the Clydeside for the latest stage of its UK expansion. Building on an earlier application for planning in principle the latest plans have been conceived by Keppie Design as part of their 300,000sq/ft Central Quay masterplan - which also includes 300,000sq/ft of office space and a 150-room hotel. Offering a range of accommodation from studio apartments through to three-bedroom flats the scheme will incorporate its own shared residents lounge, concierge, roof terraces, gym, games room and a co-working space. All being well construction work could commence by the second quarter of 2019, completing by summer 2021. Agree #1. This 20 storey rectangular building could be better described as a landmark building in its literal sense. When I'm looking for somewhere to meet my friends, I could say "Meet you at the bottom of that massive block of flats near The Ferry". As a city we seem to specialise in mundane architecture. Rent overpriced apartment on higher floor > Cheapest equipment available to max profit > Have fun with all the fumes and noise from M8/Expressway. Defies logic to me. I think this looks good but nothing has burned or revolved in Glasgow's prs sector so far other than words and pretty pictures. We're nearly 4 years since the first proposal at candleriggs and still not one new build unit. I'll believe it when I see the cranes. I thought Candleriggs had been shelved due to the lack of progress. Is it going ahead or not? Just tired of looking at that gap site. It seems to be everything in Glasgow takes an eternity to get done.....Candleriggs, the airport rail link, the old SRC site, Tradeston site, the graving docks at Govan and the list goes on. What is the problem? Progress of a sort -- filler at best but better than nothing. More a case of what comes next in the area -- good location plus there is the train station close by. Not sure the number stack up -- £90mill development cost for 500 units points to an average rent of £1500 per month for a one bed flat. Heroic would be my thoughts on this. @ yaldi re:candleriggs- the last thing I heard was that mace had sold the prs and student components of the plan to a company called inhabit who have a huge portfolio of consented schemes across the U.K. but have built nothing and are, in turn, looking to offload their portfolio. Seems like the project and it's endless string of amended planning apps ('yes' never seems to be a good enough answer) now exist to prop up the value of the site for pretend companies in the Channel Islands. #4 agreed but don't blame it on the architects (i'm not an architect btw). It's the planning 'gurus' at GCC that insist on churning out these awful grid-like facades. V positive to see a gap site moving forward but reshuffle required at GCC planning dept before they turn Glasgow into Gotham City. There does seem to be a dreadful malaise in Glasgow right now, indeed for the last ten years or so. The question is will it ever end? Whatever happened to the MVRDV vision of Winny Mass commissioned by the previous council regime- has that been bounced into the grass by the recent incumbents at City Chambers? I loved the concept of a central urban river park running along the Clyde to attract people back to the city/down to the river- also the mooted redensification of areas like Broomielaw & the central core in general. I just sometimes worry why Glasgow, apparently uniquely, has such glaring gapsites and vacancy in potentially prime sites like the Broomielaw, Candleriggs, Bellgrove, Greendyke, Gallowgate, Gorbals Street, Tradeston, Woodside up to the Canal at the Wharf, among others, that continue to remain undeveloped- in what other major European city does this happen? I do find this recurrent miscarriages of development & the slow pace of consented sites to be utterly bewildering. Is it something to do with the perception of Glasgow in the big centres of capital, mainly London? Is it an optical problem? Are we still viewed through a culturally stereotyped prism? Is it the legacy of self determination lazily categorised by the Metropolitan media as 'anti-business' etc? Is it partly the city's own inferiority complex- the conditioned inhibition for bigging ourselves up as a city 'open for business'? Is it a question of intensified generational habituation to sub-urbanisation & car dependence that impedes urban renewal? Is it a combination of all these factors & other variable we cannot yet identify? Nonetheless it is a mystery. I'd say it has more to do with the death of Bank of Scotland, the downsizing of the Clydesdale and the transformation of the RBS into a fetid husk. The non-Scottish banks didn't tread much into Scotland pre-2008 and haven't done much to build any significant presence since, while the zombies of what was once the Scottish property lending sector have become so risk-averse and indigenous developers have suffered so many liquidations since then that what we're left with is the occasional foray into Scotland from those whose portfolio is expanding and upon having a look at Glasgow they think, 'why not? So long as it's cheap...'. The returns for the rental sector in Glasgow significantly outweigh those of London (if we discount the long-term prospects for capital growth). However, planners seem determined to accept any old value-engineered pish that will need to be torn down or ignored within a couple of decades. Seems like the billion quid question to me, wonky. The massive contrast effect with Manchester's capacity to attract development makes glasgow's failure even more galling. And the lack of obvious underlying reasons for it - glasgows city centre economy & workforce being no smaller at the last census, the disparity in house prices being modest - makes it even more perplexing. Maybe we're just cursed. Jimbob I do think there's a lot of truth in what you say, so there's no question that the caprice & vicissitudes of lending is a factor. And Charlie that's what bewilders me: if Glasgow city centre is the largest GDP generator in the UK outside London, with the best infrastructure of any other city, combined with the highest rent yields ie Buchanan Street, then why the persistent malaise? A recent bogus 'debate' that clarifies the optics of Glasgow's situation is the claim by Capital council Boss Kerr than by 2032 Edinburgh will be bigger than Glasgow- that's just plain crazy talk & the fact anyone even considers reveals the power of optics. I completely agree with what you say Wonky. It's an odd case, Glasgow. We have this story we tell ourselves, that we're a poor city, yet we have the 3rd highest GDP per capita in the UK (behind Edinburgh and London), that the accoutrements of major cityhood, such as an integrated public transport system, widescale high-quality public housing or design-led commercial developments are for other places, places that can 'afford' them, places more tuned in than us. We seem to have lost the expectation that comes with self-esteem as can be seen in the bare-minimum demands placed on developers by planners. The splintering of the city into smaller fractions sees a large number of suburbanites view the city as somewhere else, a place where you might work, socialise or shop but to which you should contribute nothing while simultaneously whining about how the city needs to get its act together. For a few years, I was a poor, displaced Weegie, cast adrift in the unforgiving tundra of East Dunbartonshire and the sheer number of Bearsden philosophers who took all they could from Glasgow while defining themselves as being 'other' was something I found staggering. No harm to Bearsden, but having a decent tapas bar and a dry ski-slope isn't something that should swell its denizens with civic pride. Suburbanites: you're Glaswegians. Learn to love it. It's where you live. Help make it better. Couldn't agree more with the above comments. Any other European country would celebrate its largest city and give it the best possible representation on the world stage. Instead we have had successive Westminster, and now Holyrood governments who seem to have an agenda against the city, for whatever reason. Even something as subtle as aviation policy drifting eastwards will result in long term damage to the city's economy. Why are people in Glasgow now expected to use Edinburgh airport? Who would want to build a huge office development in the centre of a city that doesn't have direct links with Madrid, New York (for half the year), any Scandinavian cities, Milan, Zurich, Brussels and a piss poor budget service to Paris? Hardly attractive to speculative tenants. What is wrong with Edinburgh remaining the historic capital, and second largest city? Instead its crackpot leader is claiming it will one day be larger than Glasgow? Ridiculous. Sort out the local authorities in the west of Scotland. Redraw boundaries to create Glasgow boroughs. Get a rail link to Glasgow's biggest airport. Expand the subway in conjunction with a rebrand of the overground, run high frequency smaller trains and create a Glasgow transport network, rather than a national one. Offer grants to those willing to develop derelict land and buildings. Renovate the Egyptian Halls, through compulsory purchase if required. And most importantly, sort out attitudes within the city. We are the largest city, the only big Scottish city, almost half the country lives in and around here, it has stunning architecture and an amazing arts and cultural scene. Great nightlife. A very educated workforce. The most international and diverse population in the country. Fantastic shopping. A strong economy. Its time to get the ambition and pride to match. I blame the railways -- developers are throwing up 3 and 4 bed boxes in Gartcosh and Carrickstone because of the transport links. Pulls demand out of the city centre as the property chain expands on the outskirts and people move out earlier than in other cities. Interesting comments above about the permanent downer the Tartan establishment has for Glasgow -- every six months there seems to be a story highlighting the rise of Auld Reekie and the decline of Glesga. This week's piece was based of population projections which was very silent on the root cause -- official Glasgow keeps losing areas while Edinburgh is allowed to expand. South Queensferry -- they really are having a laugh now. The City deal gives the game away. The Auld Reekie city region climbs above one million in population because they include the Scottish Borders and Fife into gerrymandered locality that would have made Gerry blush. All so that they can pour money into a few square miles centered on a castle. Its only a matter of time before Glasgow is a suburb of Edinburgh. Why stop there? Lets re name Scotland , Edinburgh. The fact remains the same even with projections the West is where the bulk of the population live and if Glasgow were to extend its boundaries as other cities do it would be closer to 1, 500, 000. The lothians which contain Edinburgh, Fife and the Borders fall short of this figure. You only have to count the number of towns in excess of 20 000 surrounding both cities to know the population surrounding Glasgow far outstrips that of Edinburgh. Most of the towns are not even separated from Glasgow. Since Edinburgh got the Parliament Scotland has became Edinburgh centric to the extent that even they wanted to be the home of football as well as rugby. The rot has to stop. Glasgow airport wAs the busiest airport in Scotland for decades until the Parliament arrived. A few years later Edinburgh became the busiest. A trend that should not be encouraged. I for one refuse to use Edinburgh . Maybe if more from the West did the airlines might think again. As for the people of Fife, watch out. Even the Forth separating you from Edinburgh might not be enough to stop the councillors in Edinburgh claiming you as part of a Greater Edinburgh. Does the councillor know that the Lothian region has a combined population of 750 000 and that has not changed much over 30 years? Thanks folks, this has to be one of the most interesting discussions I've seen on UR. There is so much I agree with above. Whilst Glasgow has prospered on an international stage in the last 30 years, this seems to have been limited to sport, music and culture. As mentioned far too much inner city land is still disused as much as 40 years since it was last in use. Large tracts of IFSD remain undeveloped almost 30 years since this started. The great white hope of the 90's is nothing more than a damp squib. This isnt just a blip. And not merely a direct result of the crash 10 years ago. It surely has to do more with structural and leadership issues within the city. I would be keen to have the suburban areas tacked onto the city's boundary. My view is you wouldnt have your fancy houses and green spaces without the city so pay in to its upkeep. WE have watched/allowed the city to shrink over the last half century and no debate has been had to halt and reverse it. IFSD -- I fear that someone is working the land-bank angle to destruction. Offices are being built in the city but the 3 remaining plots with river views are wall flowers at a developing dance. Hopefully they are not zombies on someone's balance shet with pre-crash valuations that just do not fly at the moment. I fear their only hope is SkyPark jumping the M8. I don't want to sound like a defender of the company which operate Scotland's two biggest airports but the reason why there are many more direct flights from Edinburgh as opposed to The Glasgow is because more foreign tourists want to visit the place. I do however, think it's a conflict of interest to have two competing airports owned by the same company. I'd like to see a dedicated high-speed rail link between Edinburgh city, EDI airport, Glasgow city and GLA airport. That way, folk could get from one to another with relative ease. Maybe if Musk's Hyperloop evolves from a pipe dream into something as quick and affordable as promised then that may be feasible? Extend it to Aberdeen and Dundee? Glasgow to Aberdeen in half-an-hour? I don't know, just flying kites. We have had one hundred years of experience of a small region centred on the capital sucking the lifeblood out of the rest on the country with an establishment looking on and ondering what all the fuss is about. I fear we are going to repeat the scenario four hundred miles to the north with the added embarrassment that the capital involved was neither the largest city, the cultural leader or the economic powerhouse of the nation involved. Looking back the "Bonn" option based around Stirling / Alloa / Dunfermline would have made more sense. I like tall buildings,I've long thought Glasgow is a very suitable place for them, particularly the westerly end of Bothwell St., its a pity that this opportunity has resulted in something that appears pretty cardboard, but I don't know what the brief or the other external pressures were. Fully agree with the sentiment on here, even if it has got off the subject, it shows the depth of concern there is. Now that Glasgow has lost its airport status, the next thing will be the retail position. Edinburgh is currently investing about £1Billion in the St James Centre whilst Glasgow has cancelled renovating Buchanan Galleries and next to no investment in the now not so Golden Z. Why are the local authority standing by and watching this happen? #30 "next to no investment in the now not so Golden Z"
What are we getting for our £7mill? Who will see the benefit for all this spend? What happens after it is finished? Question 1. A redeveloped urban realm with encouragement to cycle and walk. Reduced traffic numbers and a larger reliance on public and sustainable transport which will make the area a nicer place to spend some time. A reduction in pollution and greenery added. Questions 2. Residents, visitors and businesses. Questions 3. The world will be a much better place. #31 - A £7Million paving slab and bushes revamp isn't going to solve the city centre issues Liam. There is no retail development to speak of happening and so Glasgow is resting on its laurels as the second best retail experience outside London and is about to be overtaken by Edinburgh once the St James centre is finished. I know many friends from East Scotland who would rather shop there once there is more choice, rather than be chased by beggars on Argyle Street. City Deal should be about transforming the productive capabilities of the city not fixing pavements. No matter the quality of the streetscape -- will the litter be picked up? If the litter is picked up in the "Avenues" what about the rest of the city? Then you have the design itself -- fussy and over complicated to the point of absurdity. Looks like the amino acid junky involved in the design is more interested in justifying the cost by expanding the design and workload to justify the spend. Separate bike lane -- waste of space and a danger to pedestrians and that is before e-bikes at 25Km/hr become the norm. Then you have the even more basic question of why the focus on bikes when we have the issue of the weather that cuts off low intensity / leisure cycling at the knees in West Central Scotland. Pavement renewal is not economic investment. Perhaps it needs to be tall because its next to the Kingston Bridge (not shown in the image) so folks who buy properties on the east side can have a nice view of the motorway.